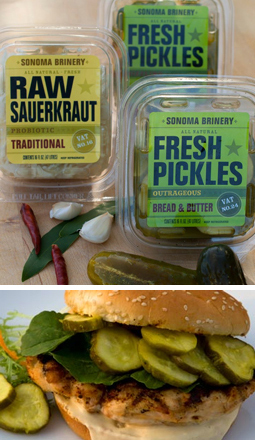 The barrel fermented half-sour is widely regarded as the “King of Pickles.” These half-sours are richly flavored with nine spices, fresh garlic and sea salt. Guilt-free -- no fat, no carbs worth counting, modest sodium, a ton of flavor, plus it’s a live culture fermented food. Not your grandmother’s pickle. Filled with Southwestern flavors and a little bit of chili heat, these pickles will light up everything from your hamburgers to your panini. If you need a little more spice, here it is. Fire-roasted red bell peppers and fiery Thai chilies gang-up to make this one special. Fresh Sauerkraut is a treat for the palette and the body. Unlike the more common pasteurized varieties, this sauerkraut has a crisp and crunchy texture, a full load of fresh cabbage flavor and a mellow tartness that doesn’t overwhelm the flavors: Traditional, Smokey Chipotle, and Dill & Garlic. While he definitely got started on the right culinary foot, his experiences as a young man broadened his horizons considerably. At 18 David went off to the Middle East to work as a volunteer on a kibbutz in Northern Israel. “When I grew up, in Novato’s bucolic past, everyone was a farmer or a rancher, and I raised sheep and goats as 4-H projects.” But in Israel, David says his main qualification was a strong back. He also learned a lot about farming in their large garden, apple orchards, wheat and cotton fields, and fishponds. When he returned to California, he went back to school to study electronics and engineering and then worked in telecommunications for about 30 years. During this time, San Francisco Bay Area restaurants provided the opportunity to experience the highest level of culinary artistry by chefs such as Masa Kobayashi and Alice Waters. 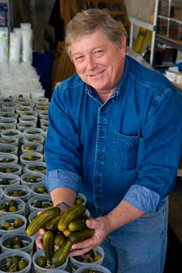 A lifelong lover of pickles, he had learned how to make fermented pickles using cucumbers from his own garden. During his years in the tech industry, he had developed his recipes, and favorite ones became the first products for Sonoma Brinery.